Goldstone delay-Doppler images of 2014 SC324 obtained on October 25. Resolution is 3.75 m x 1.0 Hz. and the observations were monostatic. received with DSS-13 due to the very short round-trip light travel time, which was only 4 seconds. This sequence spans about 20 minutes. 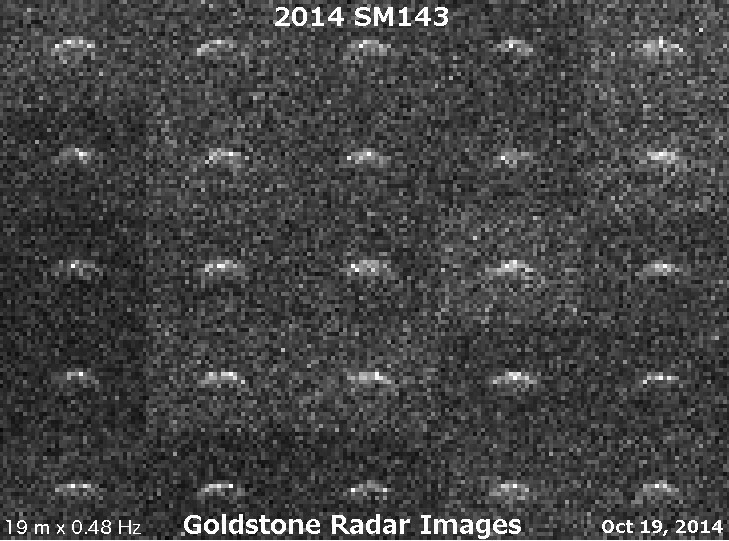 Goldstone delay-Doppler images of 2014 SM143 obtained on October 19. Resolution is 18.75 m x 0.5 Hz. The images suggest a rounded object roughly 200 m in diameter. and 2014 SC324, objects that make close approaches within about one week of each other in October 2014.
surprisingly little is known about this asteroid. suggest an extraordinarily high optical albedo of 0.6, which does not seem consistent with the spectral class. there doesn't seem to be a primary reference that actually provides a diameter based on measurements. asteroid could be significantly smaller and possibly only ~170 m in diameter. larger than expected. Several tracks are scheduled at Arecibo, where the SNRs should be strong enough for imaging. in the realm of 280 meters. Otherwise nothing is known about its physical properties. obtain images with resolutions as fine as 1/8 usec. Goldstone observations are scheduled on October 17, 19, 20, and 23. The view periods for 2014 SM143 and Hathor overlap on Oct. 20 and 23.
and got a bandwidth of at least 6 Hz, which places a lower bound on the maximum pole-on dimension of 110 meters. probably not strong enough for detailed imaging at Goldstone. much less than those for 2014 SM143. rapid rotation. Brian Warner obtained lightcurves that suggest a rotation period of roughly 39 seconds. As such, the SNRs for this object will be low. 23, and in addition, we have obtained two additional tracks on Oct. 24 and 25.
on Oct. 24 and 25.
classified Hathor and 2014 SM143 as "Potentially Hazardous Asteroids." Goldstone SNRs assume Ptx = 440 kW. Arecibo SNRs assume Ptx = 400 kW and Tsys = 25 K.
at Arecibo on October 19. Assumptions: D = 0.11 km, P = 2.1 h, OC albedo = 0.1, equatorial view. These SNRs should be divided by two to account for the 0.5-h rotation period. After Oct. 19, 2014 RQ17 moves too far north for Arecibo to track. period is much slower, so the SNRs should be significantly stronger.